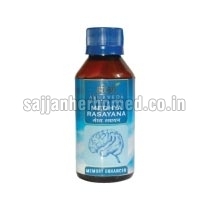 Sri Sri Ayurveda Medhya Rasayana Syrup (nervine tonic) is a potent Ayurvedic tonic composed of 8 unique herbs. Hygienically prepared, our Medhya Rasayana Syrup is completely natural & alcohol free. It enhances the memory power and calms the restless mind. Our Medhya Rasayana Syrup helps to overcome the feeling of anxiety and insomnia. It is highly beneficial for students and working professionals. It has a compilation of Shankhapushpi, Brahmi, Guduchi, and Yashtimadhu, which are known as the rejuvenators that enhance concentration and keep mind focused and sharp. Moreover, Jatamansi and Vacha reduce stammering and improve fluency in speech. Shatavari and Ashwangadha reduce physical as well as mental stress.